Christoph Gysi has been president of Vereinigung Kulturmeile Zürich West for many years, so he is, of course, one of the biggest promoters of the former industrial district. As one of its pioneers, he founded the restaurant Les Halles 20 years ago, which is an institution today. We asked him why Zurich West is no longer considered the nightlife district of the city and what is most important for its further development. He also reveals his favourite Zurich restaurants and bars. The former industrial district of Zürich West was for years the hip and daring district of Zurich, the in-place for clubbing, dining and entertainment. Some say, this is no longer true. What went wrong? Well, nothing went wrong really. Zürich West is definitely still an entertainment and nightlife district, but instead of the young and very wild, we now have a slightly wiser, more affluent crowd that frequents the district. That is not really a negative and is partly a natural development. Right now, the mix is still balanced and it’s still all happening here. But yes, we have to make sure that the district doesn’t turn into one for just elderly people. You are president of Vereinigung Kulturmeile Zürich West. What do you do to prevent the district from losing its fun nightlife status? On the one hand, we try to make sure that new housing projects offer flats for all kinds of social classes, which makes a district interesting. On the other hand, we need to keep the cultural offerings diverse and we must ensure that the district does not become too clean and high-end. In the last couple of years lots of highly subsidised institutions of the classic arts like the Schiffbau theatre house and the Tonhalle for classical music were built in our district, which don’t draw enough crowds to justify the money the city spent. Now we need a more daring cultural magnet, and we think that with the closing of the waste incineration plant in 2020, we’ve found the perfect location to realise the idea of a big culture and concert hall. Do you think the city will support the idea? Well, it won’t be easy, but we’ll fight for it. The city currently seems to have ideas for the plant such as a garage for snowploughs. We absolutely have to prevent that. This space is much too precious for such a purpose. After all these investments in the classical arts, the city has a duty to bring back some young, cheeky culture to Zürich West. What makes Zürich West special today? It’s the special mix of industrial charm, architecture, design, nightlife and shopping. We have to try to maintain this asset. What is your biggest wish for the future development of Zürich West? We definitely need more housing, which is essential for a lively district. With the many flats that have been built in the last years the district already works pretty well. A new cultural highlight, preferably the concert hall I mentioned before, would be important to keep visitor numbers high, which is important for shops and restaurants. In this way we can keep that Zürich West spirit, that unique mix alive. 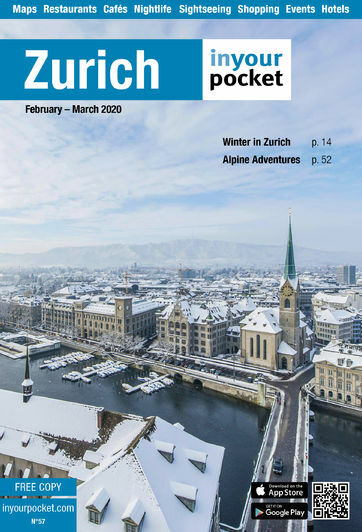 Besides Zürich West, why should someone visit Zurich? First of all, there is always so much going on in our city. There are so many events, maybe even too many. Zurich really has loads of cultural offerings. Also great, is Zurich’s compactness. It’s all here and the distances are so short. And Zurich has both, the metropolitan and the cosy. And does anything annoy you about Zurich? We are a Zwinglian city and one can still feel that. The city and its residents are over-ordered, everything is regulated and planned. Sometimes I wish there was some more room for spontaneity, some more dirt, metaphorically speaking. Which are your favourite restaurants in the city? I like institutions, restaurants that have existed for a long time and that last. I really like, for example, Haus zum Rüden on Limmatquai, not just because of the good Swiss cuisine, but because you can sit outdoors under the arches of this old house just opposite the River Limmat and enjoy the evening sun while watching the Limmtaschiff boat go by. Another long standing restaurant I like a lot is the district tavern Hornegg in Seefeld with its down-to-earth Swiss food. And just opposite, the Brasserie Seefeld is definitely my favourite Italian in town. And where do you go out? Where can we find you for a drink after work? I like the Hotel Rivington bar in the Prime Tower. This daring mix of an old bar in an all-modern glass building, the Swiss style outdoor furniture... I really like that. This place has that Zurich feeling for me. Gerolds Garten is also great for an after work drink. But my favourite bar is probably the bar at the Yonex badminton hall. I like the relaxed atmosphere there. And they have Johnny Cash in the jukebox! Whenever I show someone the district, we usually end up there. What is your favourite place in the city? I really like the Niederdorf district. It’s the mix of gastronomy, small shops and the historic houses that I love. I like the sound of the people walking on the cobblestones as that always reminds me of the holidays somehow. And where do you go to take a break and relax? If I need some time off, I jump on my bike and pedal to Ziegelhütte, a lovely and calm country inn at the edge of the city in Schwamendingen. From there I start my bike tour after some refreshment.